Sometimes the day to day grind can wear us out and get us down. Our daily fight with traffic, a boss we don’t get along with, endless homework, peer pressure, strict teachers, annoying coworkers, not having enough money, mounting bills and the list goes on. Now imagine you are eleven years old and you are diagnosed with stage 4 cancer. When we are faced with real challenges suddenly, the annoyances of our day to day life seem just a little bit more insignificant. These are the real struggles that Kadence and her family face. 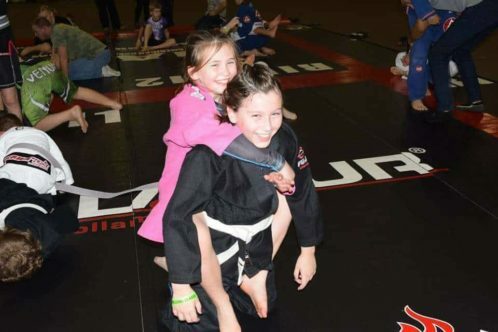 Kadence began her Jiu Jitsu journey at nine years old in 2016 when her cousin Gabby introduced her to Jiu Jitsu at Maverick Training Center. Kadence says her love for Jiu Jitsu was love at first sight. Through Jiu Jitsu she has learned to feel more safe and secure by learning self-defense. Her love for the art extended beyond the classroom and it wasn’t long before Kadence was competing in Jiu Jitsu tournaments. In late 2016 she started to complain of chronic knee pain. She fatigued easily in class and competition. It was then that her mother took her to the doctor and it was discovered that she had stage 4 Osteosarcoma. Osteosarcoma is the most common type of cancer that starts in the bones. The cancer cells in these tumors look like early forms of bone cells that normally help make new bone tissue, but the bone tissue in an osteosarcoma is not as strong as that of normal bones. Most osteosarcomas occur in children and young adults. Teens are the most commonly affected age group, but osteosarcoma can develop at any age. Kadence has been in out of St. Jude Children’s Research Hospital for the better part of a year. She has undergone several chemotherapy treatments and has had to have her leg amputated. She is a true fighter, a warrior and even though she admits that her condition makes her sad at times she doesn’t let it keep her down. She says that what keeps her going is thinking about the good times with her family, the fun times, sharing laughter and cuddling with her kitties. She is faced with a challenge that most adults wouldn’t know how to deal with. But perhaps her tenacious spirit and her training in Jiu Jitsu has helped prepare her for the real struggles she faces today. Much like the time we spend rolling on the mats, she is living in the moment and enjoying every second if it. Perhaps the self-control and patience that Jiu Jitsu has instilled in her is what has prepared her for the battle of her life. As a single parent raising three children and having one in and out of the hospital for around a year this has not been easy on Kadence’s mother. She has lost her job, her car and is struggling to raise a family and be there for her daughter. This is a situation that no parent should ever have to go through. 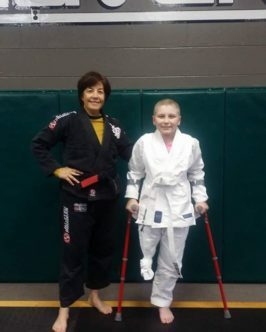 We as a Jiu Jitsu community need to come together and support her. Please help Kadence and her family through this hard time and donate. Every little bit helps.